Hated vegetable of the masses how we have embraced thee. I know a very large number of people have terrible memories of being force fed watery bitter brussel sprouts as children. I’m here to tell you that the memories will fade after trying this delicious recipe. I know my mum used to try and disguise the flavour of the poor little sprouts with bacon and onion. I did use bacon and onion for this but instead of tasting like washed out yuk the sprouts tasted fresh and delicious. 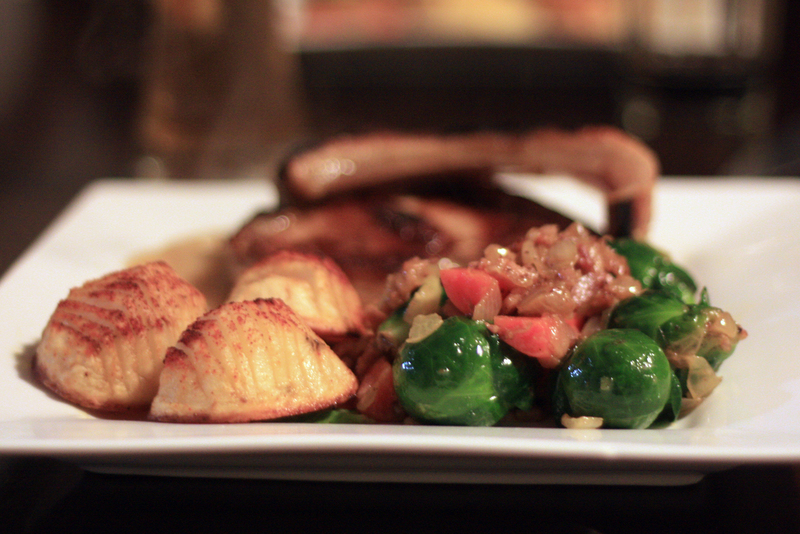 I served them with hassleback potatoes and pork chops with apple puree. Sautee onion and bacon in a drizzle of olive oil until done. Steam brussel sprouts for 2-3 minutes only, remove then stir into bacon and onion mixture serving immediately. It’s that easy. I sit a chop stick either side of the potato halves when making hassleback potatoes to make the slicing easier. Then I spinkle with paprika and roast until golden brown. hehe… it was a moment of wild abandon that neither of us regret. Seriously, they were really tasty. We were quite surprised. I’ll be making them again for certain.